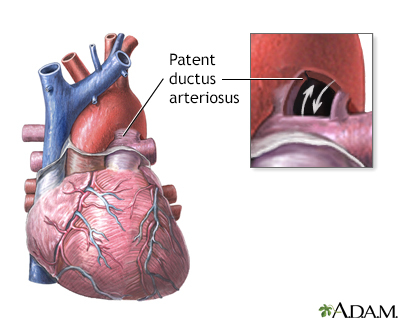 Patent ductus arteriosus (PDA) is a condition in which the ductus arteriosus does not close. The word "patent" means open. 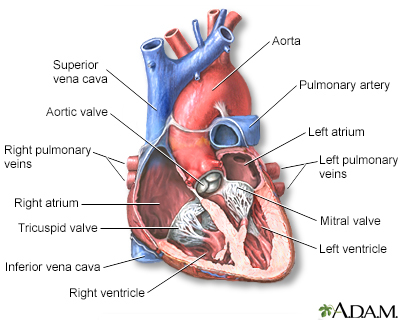 The ductus arteriosus is a blood vessel that allows blood to go around the baby's lungs before birth. 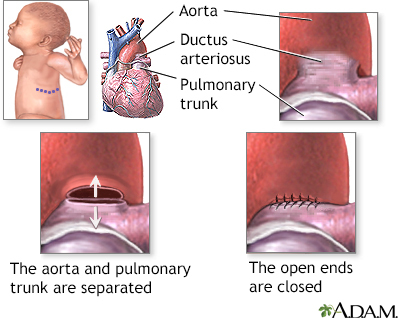 Soon after the infant is born and the lungs fill with air, the ductus arteriosus is no longer needed. It most often closes in a couple of days after birth. If the vessel doesn't close, it is referred to as a PDA. PDA leads to abnormal blood flow between the 2 major blood vessels that carry blood from the heart to the lungs and to the rest of the body. PDA is more common in girls than boys. The condition is more common in premature infants and those with neonatal respiratory distress syndrome. Infants with genetic disorders, such as Down syndrome, or babies whose mothers had rubella during pregnancy are at higher risk for PDA. 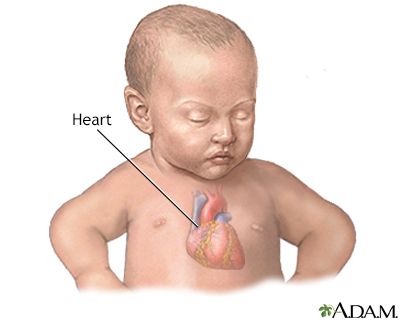 Babies with PDA often have a heart murmur that can be heard with a stethoscope. However, in premature infants, a heart murmur may not be heard. The health care provider may suspect the condition if the infant has breathing or feeding problems soon after birth. If there are no other heart defects present, often the goal of treatment is to close the PDA. 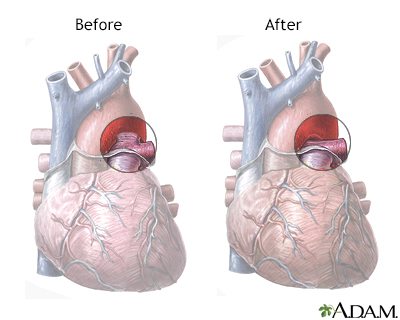 If the baby has certain other heart problems or defects, keeping the ductus arteriosus open may be lifesaving. Medicine may be used to stop it from closing. Sometimes, a PDA may close on its own. In premature babies, it often closes within the first 2 years of life. In full-term infants, a PDA that remains open after the first several weeks rarely closes on its own. When treatment is needed, medicines such as indomethacin or ibuprofen are often the first choice. Medicines can work very well for some newborns, with few side effects. The earlier treatment is given, the more likely it is to succeed. A transcatheter device closure is a procedure that uses a thin, hollow tube placed into a blood vessel. The doctor passes a small metal coil or other blocking device through the catheter to the site of the PDA. This blocks blood flow through the vessel. These coils can help the baby avoid surgery. Surgery may be needed if the catheter procedure does not work or it cannot be used due to the baby's size or other reasons. Surgery involves making a small cut between the ribs to repair the PDA. If a small PDA stays open, the baby may eventually develop heart symptoms. Babies with a larger PDA could develop heart problems such as heart failure, high blood pressure in the arteries of the lungs, or an infection of the inner lining of the heart if the PDA does not close. This condition is most often diagnosed by the provider who examines your infant. Breathing and feeding problems in an infant can sometimes be due to a PDA that has not been diagnosed.